Electric motor handpieces provide the would-be detail carver with a wholly different approach to the standard flexi-shaft tool. Their weight and ease of use makes using them for prolonged periods much more manageable than heavier duty types of machine. As a result, over the last couple of years there has been a proliferation of these machines, one of which is the Mastercarver Micro-Pro. This is a very neat machine, the layout of the switches and dial is very easy to understand and so setting up was very quickly completed. 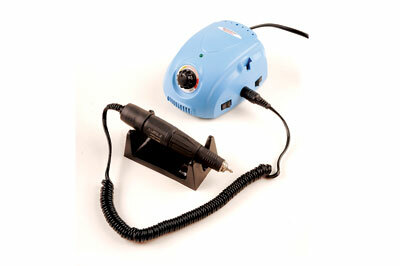 The handpiece has a top speed of 46,000rpm which for fine carving is very useful. The higher speed allows increased precision and finer control over the cutting tip. The Micro-Pro has a collet type system for securing burrs, which works using a twist lock system. This is very quick to use and makes switching between burrs and tips hassle free. I much prefer this type of quick release, as it is not unusual to want to vary the burr to achieve different textures or indeed to swap out worn burrs. I was used to using a pin and spanner to change pieces but the twist lock style removes all the fiddling about and as such increases the enjoyment of working. The control unit comes with a stand-alone holder for the handpiece and an integrated holster which I found very useful as it lifts the tool out of the dust and debris created during power carving. The unit also has provision for a foot switch, an optional extra, along with forward and reverse which can be useful for left-handed users and also helps avoid torn grain when using more temperamental woods. One thing I did notice was the lack of more detailed instructions. Set up is simple so it isn't too much of an issue; however, there is a spare fuse included in the box but no indication of where it may need to go or how to do it. Switching the machine on, it was immediately noticeable just how quiet the tool was and how little vibration was emitted, even at full speed. I started with a bud shaped texturing burr and pieces of elm (Ulmus procera) and sycamore (Acer pseudoplatanus). 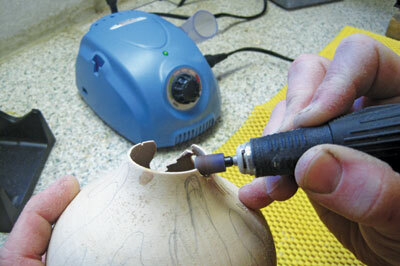 The handpiece was smooth in use on both carver friendly sycamore and the more tricky elm. The extra speed helped to mitigate elm's desire to take the bit along its more interlocked grain. 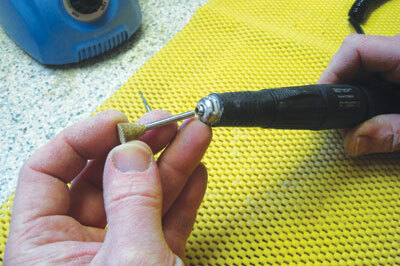 Switching to a piercing bit, the tool performed faultlessly with virtually no vibration. It was a pleasure to use for an extended period of time, something you can't say about flex-shaft tools. The lack of noise was also pleasing, a constant whine becomes distracting after a while but the handpiece runs almost silently, greatly enhancing the enjoyment of repetitive texturing. The maximum speed of 46,000rpm made precise control simple. I was able to pierce a hole extremely close to the previous one with no concern about the tip skidding. I did notice some slight extra singeing around the pierced hole but I put that down to a combination of the extra speed and my lack of familiarity with the machine. I could have continued to use this handpiece for hours though as it was comfortable, well balanced and very smooth running. I then removed the smaller collet and inserted a carbide burr type bit. These tools are not really designed to remove large quantities of wood and, under normal circumstances, I would switch to a flex-shaft type tool which is designed to cope with the stress and strain; however, as the collet size is available it is not unreasonable to expect the tool to be able to be used in this way. I was pleased to find that the Mastercarver was quite happy removing wood although I did notice that the burr did move in the collet a little when under load. Having said that, even with firm pressure on the wood the tool was smooth and quiet; it seemed not to struggle at all. Over time using it in this way could possibly shorten the life of the motor but for occasional wood removal it is certainly up to the job. Overall I was impressed with the tool's performance though, mainly, I would aim to use it for lighter, more decorative work. The lack of vibration and noise provides the user with a very positive experience; the quality of the handpiece and the simplicity of the control box makes this a very desirable machine. The quick change collet system is very easy to use and over the duration of a piece is extremely useful allowing the user to easily chop and change burrs at will. In the short time I have had the machine I can't really fault it. 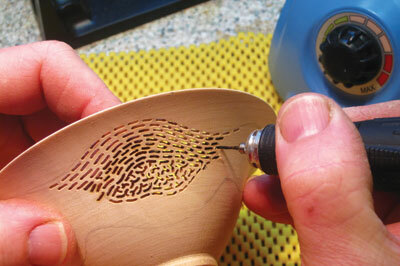 Yes, the instructions are a little light and when using larger burrs I did get the bit to slip a little, but overall, for detailed carving, piercing and texturing it is an excellent machine that looks and feels like it should stand the test of time. 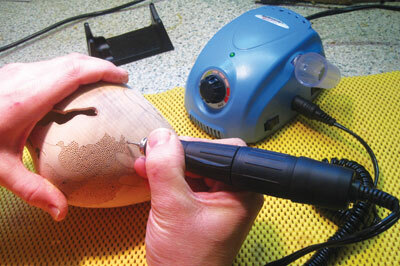 Contact (USA): Woodcarvers Supply Inc.